The benefit of these optics is razor sharp, high contrast images, without any colour aberrations whatsoever. Faint and subtle details to be observed visually and stars have the true "diamonds on black velvet" appearance only a quality refractor can provide. As a portable wide field refractor for astro imaging, this is an extremely capable wide field imaging plaform. With such excellent colour correction and contrast, faint and subtle details have considerable "pop" in images. 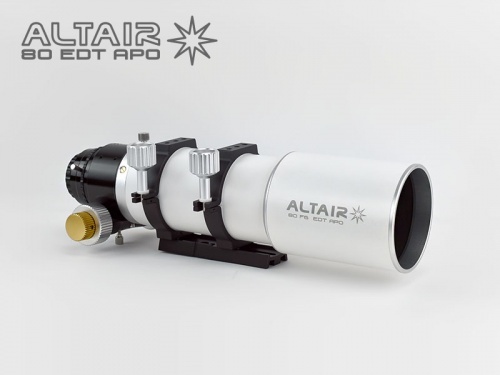 A rigid aluminium tube with two tube rings allows stable mounting for astro photography, and the rotating 2.5" Rack and Pinion dual speed focuser can handle heavy loads, whilst keeping the telescope light. The Altair Planostar 1.0x Field Flattener (PLANOS-2-1.0-80-F6-M48) converts your Wave Series telescope into a flat-field astrograph at it's fast F6 native focal length. DSLR and CCD adapters are available for attachment of various cameras (see associated products for more info). The light weight dual-speed "Rack 'n Pinion" focuser rotates on Teflon-tipped adjustable screws, has CNC machined internal knife edge baffles, and a self centering 2" rear adapter, and even a 2" to 1.25" self centering adapter with brass compression ring (sold by some companies for £50 on it's own!). The optional Field flatteners can be attached directly by unscrewing the self centering rear assembly and removing it from the focuser. The CNC focuser is compatible with the Pegasus motor focuser, for perfect PC automated or manual focusing via the hand controller or USB port and ASCOM compatible software. The new 2017 CNC tube rings are provided with standard M6 hole patterns to fit most hardware mounting systems on the market, and are fully compatible with the Altair TMS Telescope Mounting System TM. 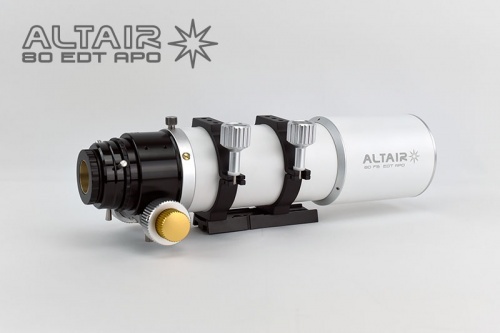 We recommend the Altair Astro 60mm Deluxe Finder Scope (see associated products below) which is a perfect fit and can double as an autoguider for imaging by adding the Altair Miniguider precision focuser adapter. For astrophotography, this size optical tube assembly is perfect for the iOptron CEM25 mount. (Please contact us for a combo price). Above is a full frame image of a portion of the North America Nebula in Cygnus called "The Wall", taken with the Altair 80/480 Super ED Triplet APO and dedicated Planostar field flattener by Anton Enright in Cambridge. Click on the image to view the full resolution image in a new window. 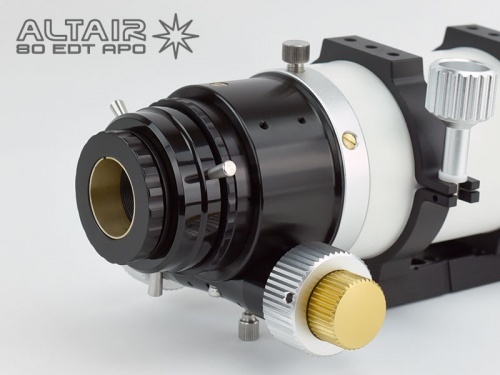 This will allow you to examine the edges of the field, to assess the quality of the specially designed Altair Planostar 1.0x field flattener. 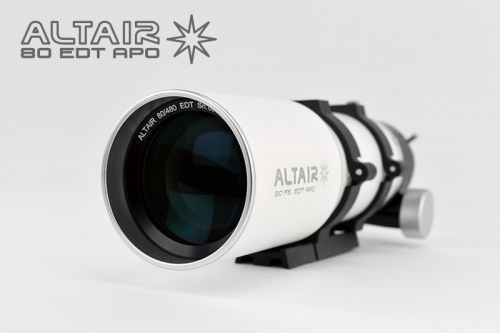 Altair Wave Series optics: Wave Series optics are repeatedly tested and re-figured at the final stages of production, until signed off by the optician in charge of the production batch. The best quality glass is used which is fully annealed and cooled over several days to relieve internal stresses. SFPL-53 is referred to as Synthetic Fluorite or Super ED. In the case of FPL53 Ed Glass, this has an Abbe number of 94.94, plus or minus .01 per batch. (Fluorite crystal by comparison is 94.99 but with slightly more variation from batch-to-batch, and has less stable chemical, thermal and physical properties). Each lens cell has a serial number engraved on the front ring. Working closely with our optical technicians, we have introduced a second and unique quality assurance process for all Wave Series lenses, to ensure the highest quality and lowest chromatic aberration. These lenses are modified in rotation and spacing, and we start off with far superior lenses to the "normal" production quality lenses offered by most manufacturers. Star tests speak for themselves, and colour correction is essentially perfect, as can be seen from the various observing reports and images taken with Wave Series refractors. Blue stars show negligible bloat in long exposure images because the blue channel is particularly well controlled. During the production process, a laser interferometer image is acquired in 532nm green light, and imported into Atmosfringe optical analysis software to create an optical test report. Astigmatism and Coma are included in the report output (many manufacturers do not include them). Each fringe image is a "snapshot in time" of the lens on the test bench. Vibration, air currents and other environmental factors can influence the image and the outcome of the report slightly, but steps are taken to minimise these during testing. Providing a test report is a useful way for us to assure that our our internal production quality is consistent from batch-to-batch. A paper report printout is included with your telescope, which corresponds to the serial number visible on the lens (an example report is shown in the thumbnail images below the main product image, with serial number deleted). Please be aware this extra QC process adds a few months between production runs and there are often gaps in stock availability. You can click the "Notify when in stock" button to receive updates. Hoya FCD100 ED (SD) glass element and mating elements housed in a precision adjustable CNC machined lens cell with temperature compensation interleaving. Super-high transmission coating (STM Coating) on all air to glass surfaces. Weight approx. 3kg, OTA length with dewshield retracted, 39cm. Precision CNC machined components and tube made from light, tough aluminium alloy with matte powder coat and hard anodising. Retractable lens shade / dew shield. 2.5" "Rack 'n Pinion" Geared dual speed focuser with 1:10 micro-focuser. Entire focuser rotates relative to the optical tube for easy photographic composition. Teflon tension-adjustment screws and Teflon collet ensure focuser rotates smoothly. Self-Centering 2" to 1.25" reducer with brass compression rings included. Front aluminium push-fit lens cap, rear plastic 1.25" dust plug. Standard 1.75" dovetail bar with stainless steel M6 cap-head screws included. Tube Rings with M6 threaded holes with 30mm spacing, compatible with Altair and most other mounting dovetail plates and bars.